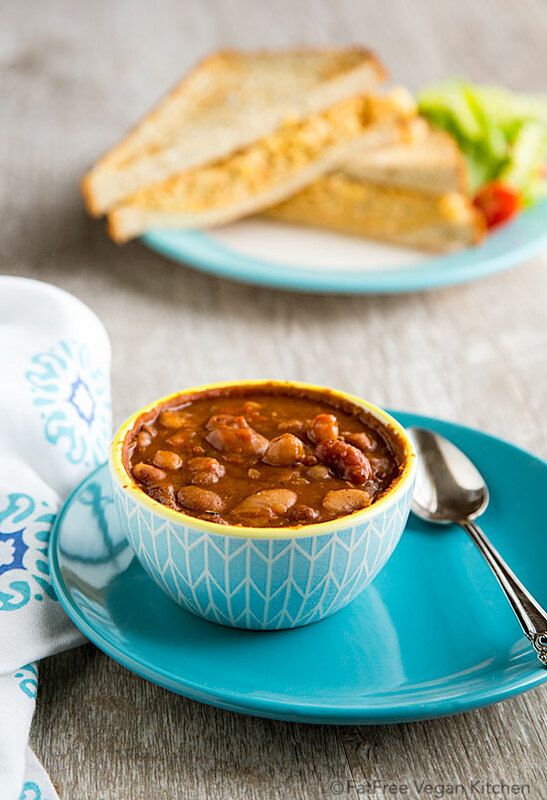 This vegan 15 Bean Soup is spicy, smoky, and full of the traditional flavors of New Orleans cooking, without all the meat! 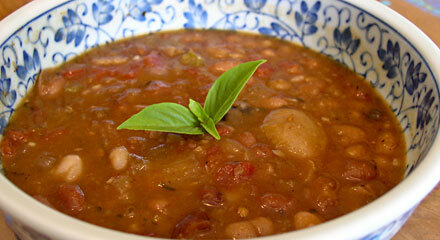 Last night, along with the collard greens I mentioned before, I served Cajun 15-Bean Soup. I made it a little differently than my usual recipe, so here’s my updated version, including an Instant Pot version. The old version used Gimme Lean sausage, so if you’re into fake meats, you might want to check it out on the FFV website. 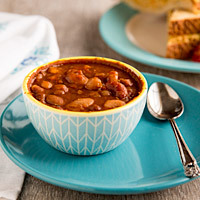 This recipe works equally well for 9-Bean or 12-Bean or any number of bean blends that include a combination of quick-cooking and slow-cooking beans. You can expect the smaller legumes like lentils and split peas to break down partially or completely, adding richness and body to the soup, while the larger beans remain intact. It’s the type of hearty soup that can easily be a meal all by itself. But add some leafy greens. They’re good for you! I save a little time by making this soup in the Instant Pot. See the instructions in the notes at the end of the recipe. Place the washed beans in a pot with 12 cups of water, bring to a boil, and simmer, covered, for 60-75 minutes until beans are tender. Add onion mixture, stewed tomatoes, and lemon juice to the beans along with the spices and simmer 30-45 minutes. (Add additional water at this time if they seem dry or thick.) Check the seasonings and add more to taste. Serve with bread or over rice, or just by itself, as I did. Put the beans into the pressure cooker with 8 cups water. Cook at high pressure for 15 minutes. Remove from heat or turn off electric PC and allow the pressure to come down naturally, at least 15 minutes--do not quick-release. Check the beans. They should be mostly tender but not all cooked (a little "crunchiness" in the larger beans is to be expected). Brown the onion, celery, bell pepper, and garlic in a non-stick skillet. Add browned vegetables and all remaining ingredients to the pot except water--you should not add water unless the beans seem too thick or dry, and if they do, add just enough to make them soupy. Seal cooker and cook at high pressure for 8 minutes (less time if beans seemed completely cooked). Allow pressure to come down naturally and add additional seasonings to taste before serving. Each serving counts as zero points on the Weight Watchers Freestyle program. Previous Post: « What I did with those collards…. love this blog – was directed here from weight watchers. wondering – would you say this is an 8 serving or 12 serving recipe? Hmmm. I hadn’t really thought about it. My first instinct is to say that it’s 8 servings. That would be 8 fairly big servings. But you could count it as 10 or 12 small servings, too. I probably wouldn’t be satisfied with one of those servings, though. I’m glad you found the blog! It’s nice to know that people on weight watchers are being directed here. I made this soup yesterday. Didn’t have paprika, chili powder so I used Chef Paul’s Blackened Redfish Magick from DH’s spice pantry and left out the salt and liquid smoke. I served with rice and large green salad. Mmm–mm. Thanks for your inspiration! I soaked the beans in water overnight for 12 hours. Rinsed them in the morning and added them to a slow cooker along with the other ingredients. I put the onion, celery, & pepper in a food processor along with some carrots. I sauted the veggies in a little olive oil for 15 minutes. I cooked the soup on low for 8 hours. I think I added too much water (12 cups) because it seemed a little watery. We added croutons and feta cheese to our bowls of soup. I agreed that while it was good I think the amount of water diluted the flavors. Thanks for all the help. I’m trying to cut out the fat and salt from my vegan diet and your site really helps. I’ve lived with congestive heart failure since 1998. I lost a lot of weight for a few years, but my weight came back with a vengance. I hardly eat anything, but still put on 60 lbs. Last month I was told I have diabetes, very controlled diabetes, but still diabetes. Just had my thyroid checked and it’s at the borderline hypothyroid. Everything I read says this is the way to eat to beat diabetes and heart disease, but it can cause hypothyroid in some people. This is a challenge, but I love eating vegan. Thanks for your help. This is probably a dumb question but are the beans supposed to be soaked before the cooking you describe above? No, they’re cooked without soaking. The bean mix includes lentils and split-peas that would be too mushy if soaked before cooking, so I just cook them unsoaked until all the beans are tender. What type of bell pepper would work best? Green is traditional, but any bell pepper will do. Susan – I know this is an old recipe but I have to tell you that I made this for dinner last night with one of your cornbread recipes and it was AWESOME! I use this website all the time when I am trying to plan my dinner menu and I have never been disappointed! You are a gifted cook and photographer! Thank you so much for taking your time to post all the recipes! I wait with bated breath for your cookbook to be published…..
Nita, thank you so much for the kind words. You don’t know how much they mean! i can only imagine how good it would be with all of the spices i’ll follow the recipe fully next time. Haha, your recipe is EXACTLY as mine. I always “cheat with the hickory smoke flavoring. I was looking for something else in the way of veggies or grains, so I’m adding butternut squash? And a veggie broth simmered and strained from the skins & seeds of the squash with celery, carrots, peppercorns, bay leaf, shallots s&p. The broth right now is better than the soup. Can’t wait to combine the two! Thank goodness I found this recipe.. I have a 15 bean package with one of those nasty seasoning packets that has been in my pantry for ages. I’ll be making this very soon!! Wow! This is a really good recipe. It was my first 10 bean soup (I didn’t have 15 varities-ha!) I think my taste buds are dead, so no insult to your cooking, I just tripled all the spices listed. The thyme and the liquid smoke really give this such a good flavor! Next time, I think I’ll triple the veggies as well. Everyone else mentioning it being too watery- I used a super big pot (large surface area) and I kept having to add more water. Keep in mind the size of your stock pot when it comes to how much should be used. Then added these to the beans with some more water and all the seasonings. Then after it simmered for a bit, I added the green parts of the bok choy. So absolutely delicious–I even had a bowl for breakfast. Crazy huh? Thanks for the recipe! Hey Susan! Question.. Think this can this be made in a slow cooker, instead of a pressure cooker or stove stop? Probably would decrease water to 8 cups, since not boiling stove top, right? What are your thoughts? LOVE your site. I share with everyone, vegan or not! Thanks! I think it would probably work. The only concern I have is if there are any kidney beans in the mix. Kidney beans have to be boiled in order to make them safe to eat, so I would avoid using them in the slow cooker unless you boil them for about 15 minutes first. Good luck! oh my goodness! I’ve been slow cooking all my beans this whole time, just read the wikipedia page about how slow cooking kidney beans does just as you said. I guess I always happened to RE-cook them in the dish I made them in, such as boiling them all mashed up in a daal with spices. I can’t believe I’ve been just one step away from poisoning myself multiple times! Can you give me a link or something to read about kidney beans and why they have to be boiled to make them safe to eat???? I am hearing about this for the first time. Sure dont want to poison my family! Thanks Susan!!! Although I changed the recipe just a tad, I very much enjoyed this soup and would make it again. I used a pressure cooker the whole way through to save dishes. I pressure cooked my bean soup mix from Whole Foods (didn’t know what 20 oz was so I used 2.5 cups with only 6 c water instead of 12) for 15 min, chopped the veggies while they cooked (I omitted the garlic, used almost the whole bunch of celery, about 2 cups chopped green beans, a cippolini onion and a shallot because that’s what I had on hand), added heaping measurements of the spices, only used 1 tsp salt, added 1/4 cup nooch, and then pressure cooked for 1 more minute because I like soup veggies crisp and not mushy. It came out perfectly! I’ve noticed you have a way with combining spices Susan! The flavor is very yummy! I tried this last week and it turned out really good. I added corn and might’ve accidently skipped a few spices but it tasted like chili when I was done… Loved it anyway. i am so happy i found your site/facebook page!!! you make the loveliest, tastiest meals. my friends don’t want to believe how good it all tastes, they hear fat free and vegan, and they go ‘yuck!! !’… =) their loss!!! Thanks so much Susan. Often times I am wondering what to have for dinner – your blog pops up and – voila !! I know what to do for dinner. Your recipes are always so delicious and easy to make. You should really put them all in a book. I have a file called FFV on my Evernote (making my own recipe book of all your recipes). Thank you once again for another delicious meal for my family. I made this today, subbing a seeded cayenne pepper for the ground cayenne pepper. I might use two next time, since the one gave just a hint of heat. Very tasty! Thanks! Delicioso! I added half a bag of frozen green beans and a cup of frozen corn. Didn’t have liquid smoke but used a little smoked paprika. So good! These soups are hitting the spot in the cold weather. 🙂 I did it in the crockpot so I didn’t have to watch it. Just made this but roasted fresh corn and turned out great. I also added cumin (which I love) and chipotle chili. Your recipes are great and helpful. I have committed to becoming vegan with the belief it is the most healthful and nutritious way to eat. Your recipes are making it easier to be creative and not be guessing what to make. Thanks! exactly. thank you for a thoughtful and accurate post. I love the 15-bean mixes for their versatility in seasoning variations. I’ve done among others Italian, Middle Eastern, Indian, and 15-bean/potato soup (riffed off Martha Stewart’s split pea potato soup recipe), and this recipe is another great fit with the bean mix. I cut the recipe in half but kept all the spices close to the same, except I omitted the table salt and used Spice Islands Hickory Smoked Salt, which I got at the gourmet store. Threw everything into the pressure cooker and it came out great. I have a question. Do we not need to drain the beans from their boiling water before adding the other foods? Thanks. I made it by precooking my beans in the IP and the recipe was lovely. No, do not drain. The bean cooking liquid forms the broth of the soup and without it, there wouldn’t be enough liquid. This is a great recipe but you have converted me to the Instant Pot. Any suggestions on how to InstantPot-ize this recipe? One of my all-time favorite soup recipes. I have a 5-quart IP so I’ve learned to add a little extra time to the cooking; it’s about 21 minutes for this recipe. I served it last night with a loaf of homemade whole wheat bread using the NYT No-Knead Bread recipe, adding chopped walnuts to the dough. This looks great. I’m making this for dinner tday. I made this for dinner Friday night. It was good but my husband and I both agreed that something was missing. File’ powder! Tonight when I heated up a serving that we’d put in the freezer, I added a good sprinkling of file’ powder and it was absolute perfection. I’m sorry I didn’t measure it but I’d say add a teaspoon and taste and add more if it needs it.